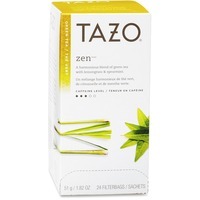 Tazo Zen Green Tea SBK149900 $5.50 Green tea provides a harmonious blend of mild flavors enhanced with lemongrass and spearmint for a cool yet crisp finish. This great tasting blend uses fragrant leaves that create a zesty, lemony flavor. Individually packaged tea bags ensure maximum freshness. Easy to use carton is perforated at the bottom to provide easy access to bags.